Globe Mallow. 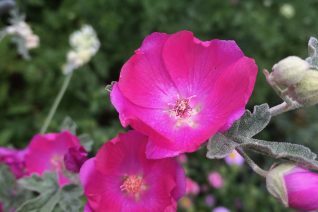 Fun and easy to grow perennial that behaves like a sub-shrub. Semi woody wands of very silvery small maple shaped leaves wave to 3′ tall. Lining these silver stems are bowl shaped hot pink flowers. They begin as early as late May and continue unabated for months. As time goes on this perennial for dry, hot locations with good drainage becomes a showy hot pink mass of blooms. Excellent on hot slopes with light but consistent summer water. Very drought adapted but light water appears to improve the performance. Loved by bees, butterflies and other pollinators. By autumn this 3′ x 3′ shrub should be left intact to over winter. In spring when new growth is breaking from the base it may be cut back hard and recovery to bloom is rapid with the onset of warmer weather. Cold hardier if given very good drainage. As far as I can surmise it will take temperatures down to about 10ºF. 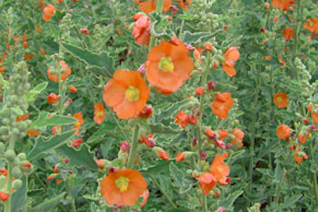 A selection or possible hybrid from two southwestern globe mallows. We’ve been impressed with the performance of this striking very upright globe mallow. Spikes clad in soft orange flowers appear continuously for months in summer. To 4′ tall ultimately this forms a semi-woody clump to 2′ wide. Full, HOT sun and WELL DRAINED soil with light summer water. Freezes back in winter almost to the ground and vigorously resprouts for the base and grows quickly when hot weather arrives. Excellent on slopes, hot gravel gardens. Not bothered by rust or other diseases that can afflict mallows. Mulch lightly for the first winter for added protection. Stunning in bloom and carefree once established. Cut back dead top growth in mid-spring. Some deer resistance. Takes blasting reflected heat well. SW native plant. An American western native wildflower that was selected for its unique flower color in the UK. Well, welcome home my pretty globe mallow. A tall growing semi-woody perennial with soft gray/green foliage. 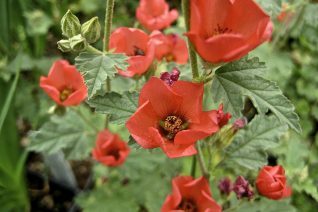 From June to September and longer cupped vivid coral flowers line the 3′ stems. It blooms non-stop for up to two months. Very pretty. Full, hot sun and rich, to average WELL DRAINED soil. A natural for a slope or included in a border where you water just on occasion. Very drought adapted for full hot sun. Do not cut this big wavy perennial back in autumn- leave the top growth as added winter protection. Cut back by 2/3 when you see new growth pushing in spring. Good drainage is key for the combination of wet + arctic air. Dry its hardy way below 0ºF- moist- well, a lot warmer. Excellent long blooming tall plant for seasonal containers as well. Does not like shade. Don’t even try. To 2′ wide.